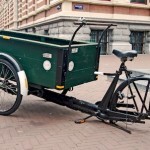 Bakfiets en Meer » Blog Archive » Who steals an old bakfiets wheel? 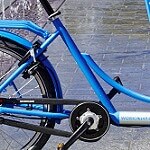 Who steals an old bakfiets wheel? 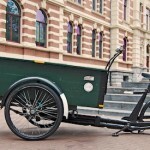 Our web developer Doede sent me a despairing note the other day telling me that the rear wheel of his new, old bakfiets got ripped off. The poor beast looks so sad, like a horse with a broken leg. 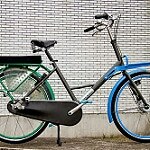 Anyhow the theft raised the question of who would bother stealing an old bakfiets wheel. They’re nearly impossible to find but then again such a wheel has no significant market value. 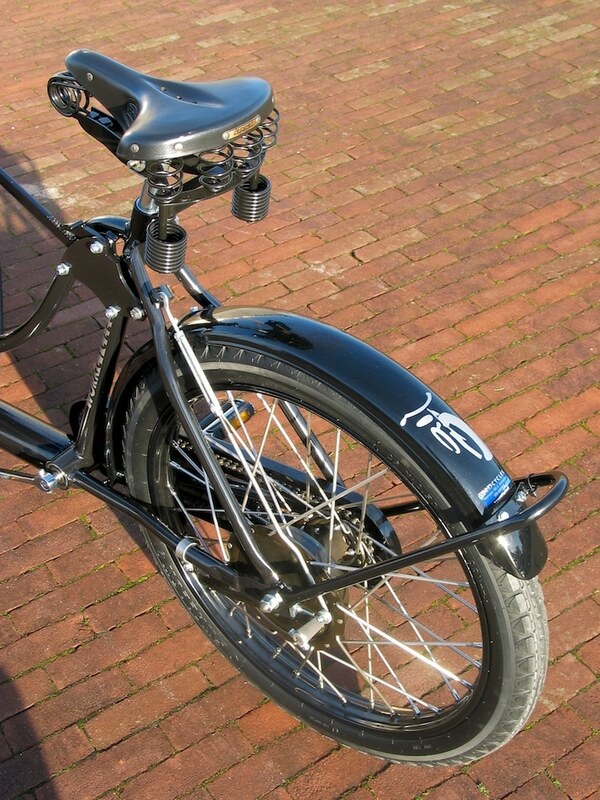 Thus Doede’s wheel was probably stolen by another bakfiets owner whose hub, drum brake or rim finally died after 40 or 50 years of faithful service. 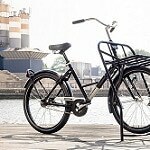 And who rides old bakfietsen like these? Well, Doede reasoned, not the sorts of people you’d expect to be stealing their fellow bakfiets riders wheels: hippies, squatters, socialists and others well to the “left” of the socio-political spectrum. Just goes to show you that you can’t judge a book by its cover… or that such demographic stereotypes don’t actually work for crap. [UPDATE 26-08-09: On Sunday while cycling out of the city with Kyoko and Pascal for a day trip we came across a scene I’d never witnessed before: A building getting broken into and squatted. A raucous mob of perhaps 50 men and women with creative hair and almost entirely black clothing was smashing their way through the door of a pretty, 17th century building in the Weteringschans. 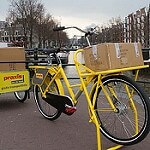 Upon breaking the door open the crowd cheered and stormed inside with the contents of a delivery van and no less than two big, old bakfietsen. 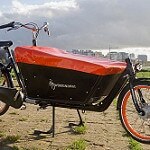 I also recognized a couple of Amsterdam bakfiets/transportfiets “colleagues” of the old skool variety. Just goes to show you that some stereotypes have a basis in reality. 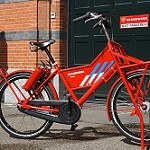 This entry was posted on Tuesday, August 18th, 2009 at 22:14	and is filed under Antique/old bikes and history, Bicycle parking and storage, Bikes in use, Cargo trikes / Bakfietsen. You can follow any responses to this entry through the RSS 2.0 feed.You can skip to the end and leave a response. Pinging is currently not allowed. Since your blog doesn’t seem to accept trackback (owh, talk to your webmaster ;)) I’ll just post my thank you here. Thanks for the article, I don’t think we’ll find the thieves, but at least it has been said. We’re looking for a new wheel and the fallen horse will ride again soon. Will let you know. 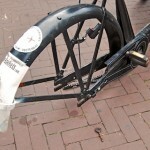 I’ve posted an article as well on the theft of the bakfiets wheel, in Dutch however, at Doede’s Journal: Bakfiets criminelen. Bolted on cog eh? 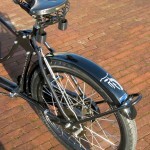 Are the fixed wheel Transportfietsen the same? In Ireland People who have the Bayonet Wheels on their Modern Bikes are always worried that they will be Stolen .So they either take the front wheel with them or else have two Locks to Lock everything up,but this is Ridiculous. 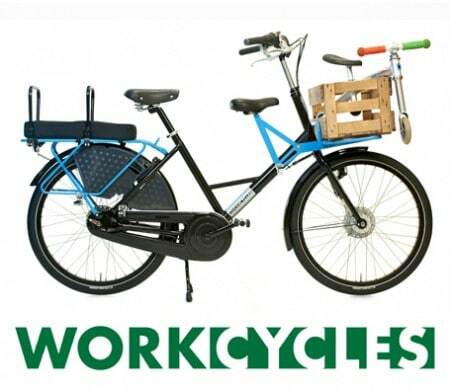 You will have to get Three Locks to stop the Tea Leafs making off with them on your Bakfiets.Or Else one Enormousely Long Huge Padlock and Chain. Doede, Nope I turned the trackback off after being constantly pestered by trackbackspam. Trackback off and voila: end of problem! 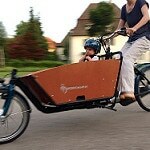 I’m actually very curious what make bakfiets it is, since the frame is a very unusual construction; It’s fabricated from sections of formed sheet steel. 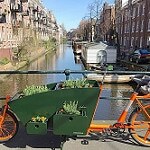 I’ve never seen another bakfiets of this type. I’m guessing it was built in the 1950’s or 1960’s since that’s when the Dutch (and Japanese) were busy building bikes in this style. The builder was probably also a larger firm since formed sheetmetal requires expensive tooling, thus somebody expected to build these frames in large quantities. 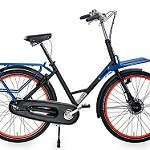 Sparta is best known for their adorable, sheet-metal “ABC” bikes though they also built them for other makes such as Batavus. This type of construction was probably an offshoot from their moped and motorcycle divisions. 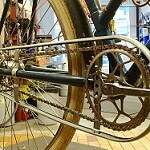 The fixed wheel transportfietsen (2-wheelers thus) had different types of hubs, more like modern track hubs with screw on cogs. The difference was that the 2-wheelers didn’t have drum brakes in the rear wheel… or brakes on the front either, for that matter. 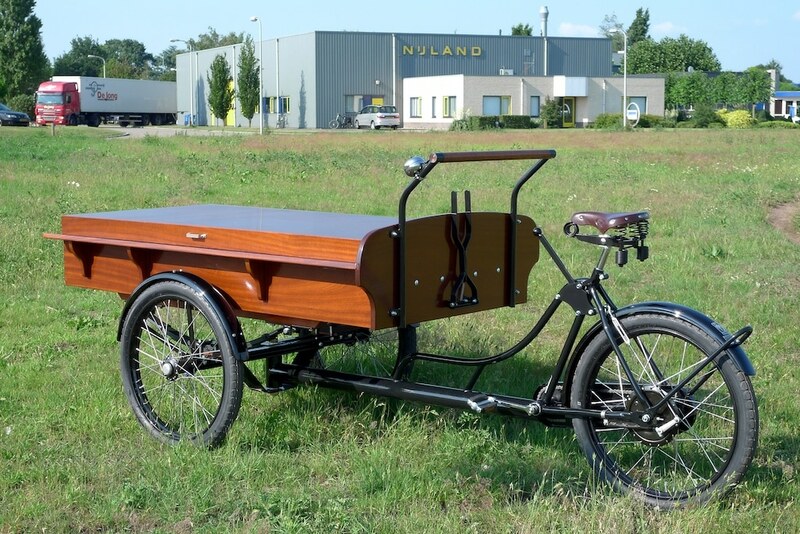 2-wheeled transportfietsen were also built slightly less crazy overkill strong. 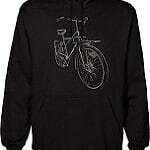 Rear wheels could be either 28 x 1.75 (all pre WW2 bikes) or 26 x 2.25. 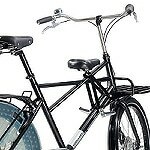 The spokes were generally 12 or 13 gauge rear though often thicker in the front where the load sat. Beautiful Bakhearst(!!). 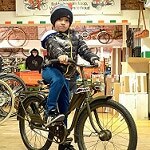 How wide is the front of the bike? 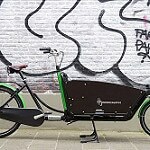 Matt, Not sure whether you’re referring to Doede’s bakfiets-sans-wheel or our shiny new bakfiets with lid but… our XL bakfiets has a box 85cm wide and is 130cm wide in total at the hub caps. 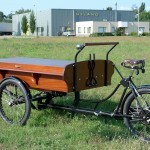 do you have any photos of a coffin going to church on a bakfiets?? Check out the post from Jan 10th 2008.